Ever since debuting at Survivor Series 1990, the Undertaker had been on a roll in the WWF. There weren’t many men that were able to defeat the Phenom in his first six years in the promotion. Little did anyone know that on April 1st, 1996 he would face his greatest opponent – a man who would give him issues for the next several years. The night after WrestleMania XII saw the debut of the deranged Mankind. He wore a leather mask, had hair missing from his head and didn’t have a right ear. It took Mankind less than an hour to get his hands on the Undertaker. Mankind attacked the Undertaker during the main event of the April 1st edition of RAW and shoved his fingers down his throat to knock the Deadman out. People were in shock to see a man smaller than the Undertaker control him with such dominance. It would be over a month later before Mankind attacked the Undertaker again. It would happen during the May 13th edition of RAW. The attack was during a confrontation the Undertaker was having with WWF Intercontinental Champion Goldust. Mankind would actually lock Taker into a casket and beat on it with a pole. This was a formation of an odd partnership between Mankind and Goldust. At the eighth edition of In Your House, Mankind helped Goldust beat the Undertaker in a casket match. This would lead to Mankind and Undertaker feuding one-on-one. They would have their first major televised singles match at King of the Ring 1996. In what had to be considered an upset, Mankind was able to beat the Undertaker at the event and it cemented Mankind as a threat to not only the Undertaker but also to anyone else in the WWF. The following month, the Undertaker was attacked by Mankind during a match with Goldust. Mankind popped up through the ring from the bottom and caused a disqualification. Things would get very interesting and violent come SummerSlam. At SummerSlam they would compete in the first ever Boiler Room Brawl. They brawled for nearly a half hour until they reached the ring where in a shocking turn of events, Paul Bearer would turn on the Undertaker by hitting him with the urn and handing it to Mankind to give him the victory. Mankind not only had Undertaker’s number but he now had Taker’s manager! The following month would see the Undertaker finally win his feud with Goldust and Mankind would get a shot at the WWF World Champion, Shawn Michaels. The match between Michaels and Mankind is considered to be one of the best matches of the 1990s. The feud between Mankind and the Undertaker would continue the next month. Any kind of normal match would not solve anything between the Undertaker and Mankind, so on October 20th, 1996 they squared off in the first ever Buried Alive match. 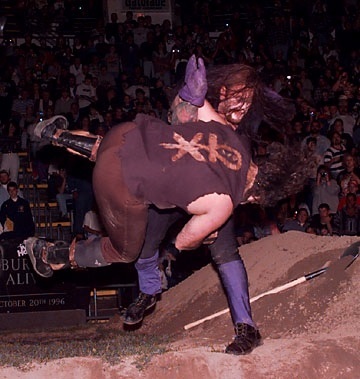 While the Undertaker technically won the match by putting Mankind in the grave, Mankind was able to literally bury Taker underneath pounds of dirt with the help of several heels. However, the Undertaker made it clear he wasn’t going to be going anywhere as he raised his hand through the dirt to close the program. The issues between Taker and Mankind were not over with. They would have another showdown at Survivor Series this time with Paul Bearer being inside a cage above the ring. If the Undertaker was able to win the match, he would get five minutes alone with his former manager. Taker won the match cleanly after hitting a Tombstone, but after the match, Taker was attacked by the Executioner, which would lead to them having a match at the December IYH show, where Taker would win. For a few months Mankind and the Undertaker would go in different directions. Mankind would team with Vader and fail in winning the WWF World Tag Team Championships while the Undertaker would main event WrestleMania XIII and win the WWF World Championship. These two collided again at In Your House #14 on April 20th, 1997. Mankind would be the first challenger for the new champion. Leading into the match, Mankind tossed a fireball into Taker’s face and seemed to be obsessed with lighting him on fire. The Undertaker was able to survive the attack and successfully defend his championship after hitting a Tombstone piledriver. Their feud would end for the time being but they would engage in a memorable match in June 1998. I’m sure you’ve heard of it. The reason for their most memorable showdown started when Mankind screwed the Undertaker out of a number one contender’s match involving Kane. So, the Undertaker got his wish to get revenge against Mankind and it would take place inside Hell in a Cell. Mankind was tossed off the top of the cage through the announce table and chokeslammed through the top of the cage into the ring. After seventeen minutes, Taker was able to win the match and put the final nail into their memorable feud.